Red Cherry Lashes are handmade with 100% human hair and are designed to create various effects and to naturally accentuate different eye shapes. At the office or out and about, our natural Red Cherry Lashes are great to emphasize and create illusions for gorgeous fluttering eyes for any occasion, even for everyday use! These lashes can be used over and over and are preferred by celebrities and makeup artists worldwide! (also known as Red Cherry CHLOE False Eyelashes) are beautiful black false lashes with great length and just the right amount of volume to accent your own natural eyelashes. (also known as Red Cherry THERESE False Eyelashes) are lush, natural-looking black false eyelashes, moderately full and lengthy. 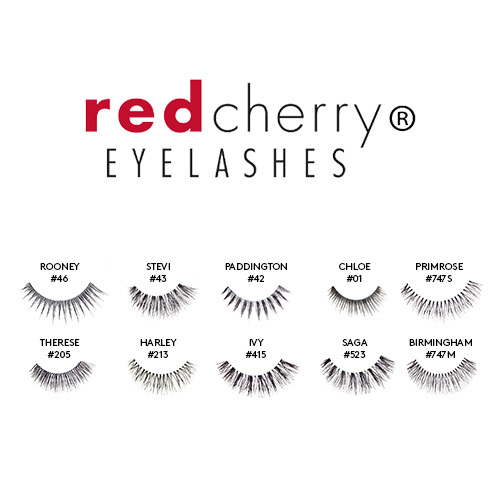 (also known as Red Cherry HARLEY False Eyelashes) are lush, natural-looking lengthy black false eyelashes. (also known as Red Cherry PADDINGTON False Eyelashes) are spiky style, moderately full black false eyelashes, with graduated length. (also known as Red Cherry STEVI False Eyelashes) are full black false eyelashes, with graduated full length. Style is similar to a shorter version of Ardell Fashion Lashes #113 and is comparable to MODELROCK LASHES Kit Ready #43 eyelashes. (also known as Red Cherry ROONEY False Eyelashes) are subtly full black false eyelashes, with graduated length. Style comparable to Bullseye GRACE Lashes. (also known as Red Cherry SAGA False Eyelashes) are long and voluminous black false eyelashes. This style is similar to Ardell Fashion Lashes #122. (also known as Red Cherry PRIMROSE False Eyelashes) are natural-looking, full black false eyelashes. This style is similar to Red Cherry Natural #747M, but slightly shorter in length. Style is comparable to Ardell Runway Daisy and Bullseye INGRID Lashes. (also known as Red Cherry BIRMINGHAM False Eyelashes) are lengthy black false eyelashes. This style is similar to Red Cherry Natural #747L, but slightly shorter in length. 1. After removing lash from tray, hold it at both ends and flex a few times. 2. Bring lash to eyelid and drape along lid (as close to the edge of your natural eyelash as possible.) Then, press in place. If lash is too long, remove it from eyelid and trip with scissors along the outer edge. Grab yours now at Sample Room!